Where do I buy cards? How to make a trash pump…cheap! NEW! Floating LED light for the Prusa i3 3D printer! 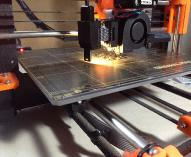 An LED light that travels along with the extruder so you can see what you're printing! 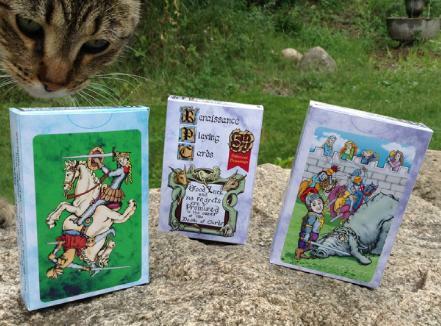 Illustrated Renaissance Playing Cards are available now!!! A 2 deck set! Two different color illustrated backs and 54 different drawings on the front. Click here to order on-line (retail orders). Click to see the 54 spade, club, diamonds and heart illustrations. The artwork for the two backs is shown in the photo below. Recently Fran agreed to share what she does to handle her curly hair. As she says "I used to spend a lot of time brushing and drying my hair every day and at some point I just got tired of doing all that work. Now I have a quick and easy way of washing my hair that I only have to do every four days or so! And I don't have to even brush it anymore!" Just yesterday I accompanied her to the doctor's for one of those tests you're supposed to get when you turn a certain age. Somehow this hospital has about seven nurses and a doctor involved somewhere along the line (no exaggeration!). All of them commented on how beautiful and thick her hair is. When they were were putting an oxygen tube under her nose it had to be hooked over her ears and the doctor said to his nurses, "You're right about her hair! I'm having trouble finding her ears!" Oh, and Fran's results showed she is healthy as a horse (a very pretty horse, of course). Second day curls — refresh, revive, maintain, and moisturize quick and easy!!! Here are the links to the products she uses. You can get the directly from Aveda or Amazon. Fran's favorite hair dryer on Amazon! I followed the Healthy Skin Program. Here I describe many treatment options for curing scabies. Where to get supplies and how to do it yourself. If your printer is having misfeeds and paper jams, the cause is often a faulty pickup roller. The pickup roller is what grabs the sheets and pulls them in. Learn how to fix or replace the roller. I did some research and bought a generator. I really like it! I have a variety of topics on my web site. From fixing paper jams to hair care to curing scabies to my artwork. I am in the middle of completely redesigning my web site. More pages will be showing up as I get them completed. At the bottom of every page is a link to email me. I do my best to answer every one. I have personally bought and used almost everything I mention on my web site. I search for good deals on good products for myself and tell you where to find them. If you buy from Amazon I do get a small commission, but you get the same price you would anyway. Other stores I mention pay me nothing, but if they are convenient or have a good deal, I tell you. I'm not getting rich doing this! The day I break even will be a happy day! Thanks for your support.